Who is Generali Assurances ? 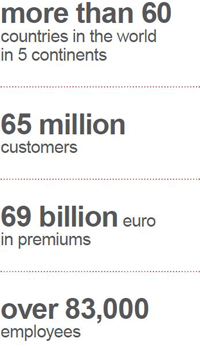 The Generali Group, the third biggest largest European insurer, operates in 69 countries on all continents. Its business includes insurance and it also provides assistance through its subsidiary Europ Assistance. Generali insurance offers a full range of products (life and loss) relying on the skill and dynamism of more than 1,300 general agents and numerous brokers. With over 300 billion EUR assets managed, its policyholders benefit from optimum exposure to financial markets. Founded in Trieste (Italy) in 1831, Generali Group is one of the leading insurers in Italy, Germany, France, Austria, Spain and Switzerland and boasts strong market positioning in Central-Eastern Europe, China and other high-growth countries. The Group operates in more than 60 countries in the world with over 70% of its premium income from foreign markets. The Group’s core business is insurance. With an annual premium income of €69 billion, Generali serves over 65 million customers with more than 83,000 employees and a strong distribution network of 100,000 professionals.